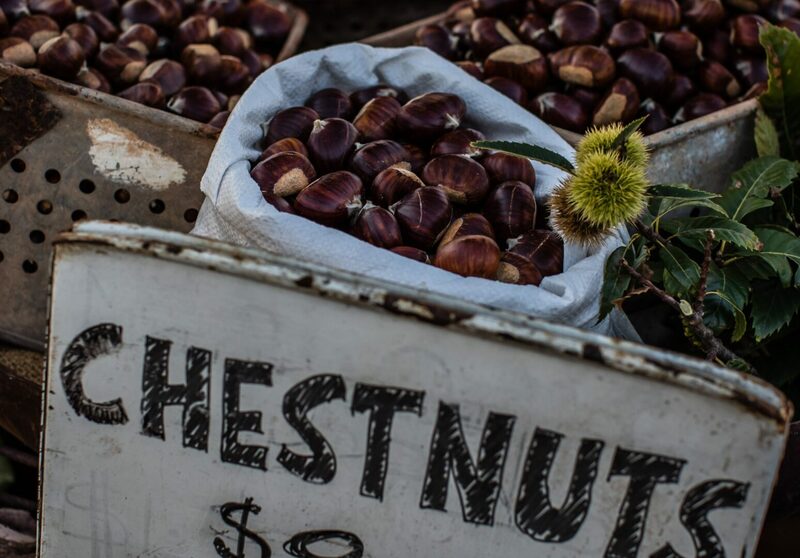 This video captures why the chestnut season was special to me growing up at the foothills of Mount Vesuvius and continues to be so today. Special thanks to our talented and generous filmmaking friend Andrew Beck. In Autumn, chestnuts are ready to pick off the tree when the protective, spiky outer layer has opened up to reveal its beautifully glossy interior. Wear good, thick gloves to prize out the nut. If there are chestnuts on the ground still in their protective layer, roll them under your foot; this will make it easier to extract your treasure. When buying chestnuts from a greengrocer, check that they’ve been stored in a dry, cool place and that they’re still looking beautifully glossy. Score the chestnut: place a cross or a single line across the flat face of the nut. This makes peeling easier and avoids the nut exploding (it can happen – ask my father!). Place the scored chestnuts on a rack; this helps the air to circulate around them. Alternatively, place them on a baking tray and shake them after ten minutes. They’ll be ready in around 20 minutes. The scored marks will have widened and the creamy flesh within will have become tender. Remove them from the oven and wrap them in a tea towel for a couple of minutes; this softens the shells and makes peeling easier. You can now add your roasted chestnuts to everything from fresh pasta and baked risotto to a simple bowl of steamed seasonal greens dressed with a splash of olive oil. Personally, I like them with just a pinch of rock salt, a glass of estate red and a roaring, open fire.